Natalie Merchant. Sigourney Weaver. Tabitha Soren. Wendy Wasserstein. Rebecca Lobo. Lauren Hutton. Anita Roddick. Lynda Barry. These are among the thirty-three extraordinary women who lend their diverse voices to this outstanding collection of stories, songs, poems, comics, and essays that will give every adolescent girl reason to feel hopeful about making the transition from girlhood to womanhood. Dealing with subjects like popularity, success, communication with boys, speaking one's mind, and body image, here is a book that offers help and inspiration to girls as they struggle to find a portrayal of womanhood they can call their own. 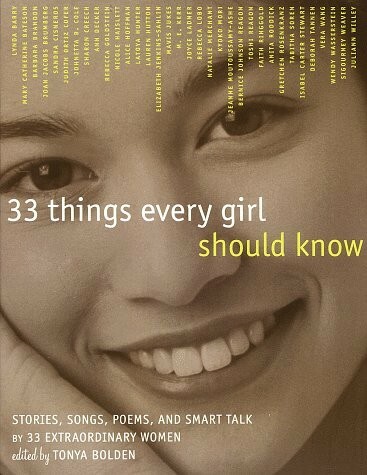 33 Things Every Girl Should Know is an empowering and inspirational gift book that every girl will want to own, to share with friends, and to use as a springboard to self-knowledge, self-acceptance, and self-esteem. Editor Tonya Bolden makes no bones about it: "It's no secret. This book is about girl build-up." Accordingly, the pieces collected in 33 Things Every Girl Should Know have the spicy flavor of rabble-rousing. But instead of a radical call to arms, readers will find more of a call to self-esteem, self-respect, and a summons to keep their eyes on a bright future. Subtitled "Stories, Songs, Poems, and Smart Talk by 33 Extraordinary Women," this collection offers young women first-hand advice from such diverse luminaries as Lynda Barry, Sandra Cisneros, Johnetta Cole, Alice Hoffman, Lauren Hutton, M. E. Kerr, Rebecca Lobo, Natalie Merchant, Faith Ringgold, Tabitha Soren, Vera Wang, Wendy Wasserstein, and Sigourney Weaver. These grown-up girls hearken from many realms and backgrounds, with widely varying experiences and skills, but all join their voices here to offer insight, advice, and a surprising expanse of common ground. From a fiercely funny comic strip about mean girls, to a moving essay about living with spina bifida, to a forensic discussion of why it's not a crime for girls to love science, these stories reflect and encourage female wit, wisdom, and perseverance. Most of all, the essential 33 things display the infinite range of options for girls, and will inspire young women to pursue the pathways paving their dreams.